The postal authorities of Austria started issuing their postage stamps with a series of imperforated stamps on a rough paper featuring the coat of arms. This took place in June 1850. 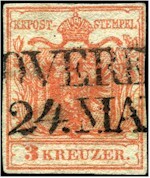 3-kreuzer stamp of 1850; note the rough surface of the hand-made paper. The introduction of a machine-made paper in 1854 eliminated the manual manufacturing of paper. The profile of Emperor Franz Josef on stamps issued between 1858 and 1861 were gradually replaced by the coat of arms issue in an oval frame, but reappeared in 1867 due to the establishment of the Austro-Hungarian Empire until 1907. 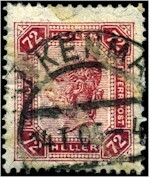 These stamps were validated in kreuzer, gulden, heller and krone. For the collector of Austrian postage stamps, the appearance of diagonal bars is quite extraordinary. In 1899, these ‘varnish’ bars were applies to the stamp paper before printing. This was done to prevent the cleaning and reuse of stamps. This method was last used with the 1908 issue. Also, in 1908, a series of large pictorial stamps commemorated the 60th year of the Emperor’s reign and depicted previous royal persons too. These stamps were released again in 1910 by adopting the previous designs but accomodated the dates “1830” and “1910” for celebrating the Emperor’s Birthday Jubilee (80th birthday). The 1916 series depicted the Emperor with the Austrian Crown and the coat of arms, followed by the brief appearance of Emperor Charles the First between 1917 and 1919, before the republic was established. 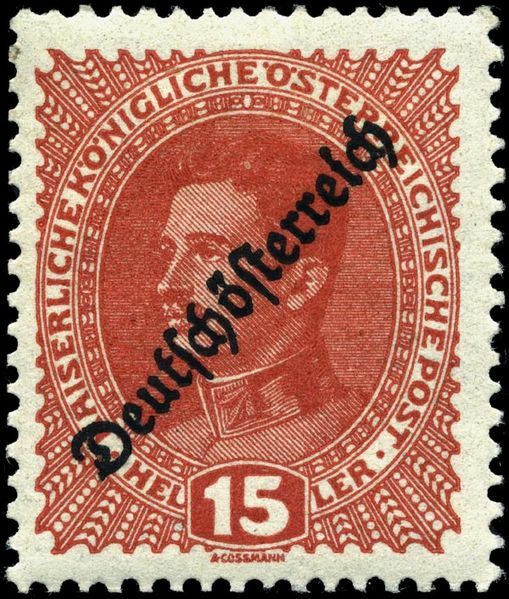 The first issues of the German Austria used the earlier stamps of the empire with overprints of "Deutschösterreich" in early December 1918. In 1919, the republic issued new designs with the posthorn, the coat of arms and other new artistic elements with the inscription of DEUTSCHOSTERREICH. By 1922, the inscription changed to OSTERREICH. The hyperinflation on the 1920s forced the Austrian postal authorities to print new stamps in increasing denominations that reached up to 10,000 kroner in 1924. A year later, a new monetary system introduced the schilling denominated into 100 groschen. Noticeable issues were also the scenic views issue of 1929 and the regional costumes of 1934. 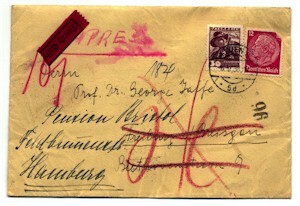 The March 1938 entry of German forces saw the end of Austrian stamps but the transition of the postal system took several months, during which mixed franking allowed the usage of German and Austrian stamps. Following that period, German postage stamps were used until 1945. The effect of World War II on the postal system was as such, that the Allied occupation forces used stamps printed in the United States, and the Soviets overprinted German stamps before issuing locally-printed stamps. The overprinting of German stamps from May 1945 was just "Österreich" and a bar obliterating the "Deutsches Reich" inscription. Hitler's face remained visible and after complaints, manual obliterations of the face were done until the arrival of new (stripes) overprints on 21 June 1945. New stamps inscribed "REPUBLIK ÖSTERREICH" were issued on 3 July by the Soviets for use in Vienna and surrounding areas, still denominated in German currency. On the other side of occupied Austria, the Allied Military Government issued the 28 June series of posthorn stamps for use in areas under Allied occupation and were valid until 1947. Austria maintained foreign post in the Mediterranean area in the 19th and early 20th centuries. stamps, designs otherwise identical to the contemporary Austrian issues. Lombardy was annexed to Sardinia in 1859 and Venetia to the new kingdom of Italy in 1866, and the Lombardy-Venetia stamps went out of use. Today, they are considered as uncommon. By the end of World War I, Italy captured the Austrian territories of Trintino and Venezia Giulia and in 1918, Italy issued overprinted stamps for these areas. Stamps sold at Trieste were overprinted "Regno d'Italia / Venezia Giulia / 3. XI. 18." on Austrian stamps of 1916, and then just "Venezia / Giulia" on Italian stamps, while in the Trentino the overprint was "Regno d Italia / Trentino / 3 nov 1918" on Austrian stamps and then just "Venezia / Tridentina" on Italian stamps. In January 1919, Italy issued overprinted stamps for all of the occupied territories (eg. "5 / centesimi / di corona"). This lasted until September, when the Trentino was annexed to Italy and used Italian stamps thereafter, while Trieste became a free city.